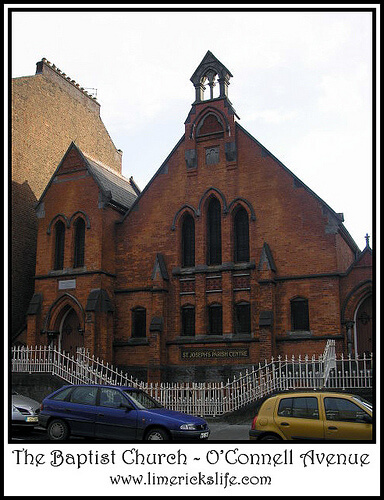 Baptist Church on O’Connell Avenue was built in 1894. It was designed by George P Beater of Dublin and built by P. Kennedy, 3 Military Road (O’Connell Avenue). The building of redbrick and limestone cost over £2,000 to complete. The building contained a lecture room, several classrooms and could seat up to 300 people. The last service in the church took place in 1992 and was attended by 60 people, their new church was completed in Caherdavin soon afterwards. In 1994 the adjoining St. Joseph Roman Catholic church acquired the building and turned it into a parish centre.